Market Notes – We are holding off further new sales for the big 3 for 1 more week while continuing to pick away at Chickpea to get everyone caught up to 75% and Flax to 100%. Canola in all likelihood should drop another 30-60c to find a firm bottom before a bounce back to some $9 plus pricing but $9 buys a lot of Canola right now and we need rail to ramp back up to Sep-Dec levels for Elevators to get a little more aggressive. Crush continues to disappoint over the last 5 weeks at only 75-80% of capacity – this was supposed to be part of the transportation fix for us as 1 CanolaOil car is 2.0-2.5 CanolaSeed cars – a highly efficient mechanism for mitigating freight problems. We fundamentally are not as positive as we once were but are not aggressively selling past 60% Canola or 75% Durum yet as we fully believe holding 15-20% into early 2015 will pay off for these two crops so we have only 1 sale left to make of each crop then over the next 3 months – no point being too hasty now unless you absolutely cannot hold 20% into the new year. 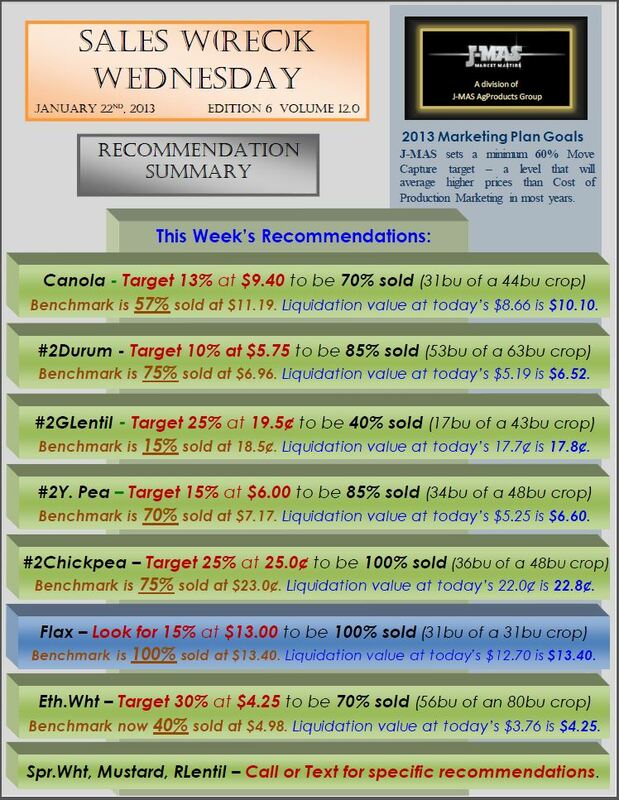 We will however be ramping up Lentil sales over the coming 6 weeks even though we remain Bullish into seeding there – but less so given the fact that $9 Canola and $5 Durum are just too comparable to a 19c Lentil and there is a less upside to the acre buying rally that we sill fully expect to happen over the next 6-10 weeks.